The famous company Blancpain has expanded the Villeret collection with the novelty Quantième Perpétuel 8 Jours. At the exhibition BaselWorld 2014, the watchmaker Romain Jerome has introduced its exclusive novelty Moon Orbiter Speed Metal. The company Glycine at the annual watch exhibition BaelWorld 2014 will officially unveiled its novelty Combat Sub Quartz. At the exhibition BaselWorld 2014, the German watch brand Mühle-Glashütte has introduced a novelty Antaria Date, which is named in honor of Antares - the brightest star in the constellation Scorpius. Famous watch and jewelry companies continue to amaze visitors of the international exhibition BaselWorld 2014 its incomparable products. At the international exhibition of watches and jewelry BaselWorld 2014, the known watchmaker Linde Werdelin has introduced three novelties: two models SpidoSpeed and one model Oktopus. The well-known company Breguet, at the exhibition of watches and jewelry BaselWorld 2014, has introduced a novelty Classique Tourbillon Quantième perpétuel 3797, equipped with tourbillon and perpetual calendar. At the annual exhibition BaselWorld 2014, the watch brand Mühle-Glashütte has introduced a novelty Terrasport I Chronograph. The watchmaker U-Boat at the international exhibition BaselWorld 2014 has officially unveiled its novelty Chimera 48 Carbonio. In celebration of the 30th anniversary of the flagship model Chronomat, the watch brand Breitling launches a series of watches Chronomat Airborne. The watchmaker MB & F at the international exhibition BaselWorld 2014 has introduced a desktop clock Starfleet Machine, made in the form of a spaceship. The new limited model Bifrost Isblå by the Swedish watch company Gustafsson & Sjögren (GoS), which is the first model from the Bifrost collection, named in honor of the holy rainbow in Norse mythology, which is a bridge connecting the earth (Midgard) and the realm of the gods (Asgard). The watchmaker De Bethune at the international exhibition of watches and jewelry BaselWorld 2014 will officially unveil its new watch DB29 Maxichrono Tourbillon (Ref. DB29RS1). The new model 1940 Radiomir Chronograph Platino by the famous watch company Panerai is presented in a 45 mm case, made of polished platinum. At the annual exhibition BaselWorld 2014, the German watch brand Mühle-Glashütte will present its novelty Kampfschwimmer. 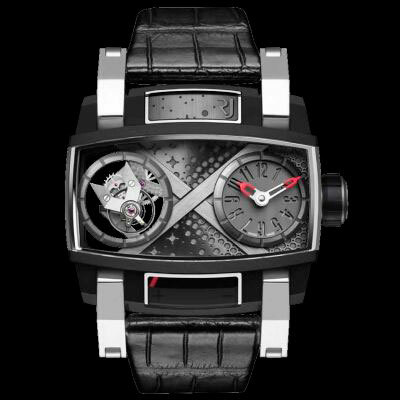 Romain Gauthier, born in 1975 in the Vallée de Joux, began his career by studying the secrets of precision mechanics, received a diploma of precision devices designer. The worldwide watches and jewelry exhibition BaselWorld 2014 opened its doors in Basel (Switzerland). At the international exhibition BaselWorld 2014, the Swiss watch company Montres duManège will officially unveil its novelty DM-Exploration. In 2009, the aircraft Airbus A320, carrying out flight 1549 from New York to Seattle, is made an emergency landing on the water of the Hudson River in New York.